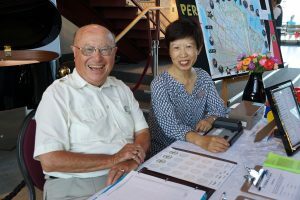 The Festival of the Sound runs on its volunteers—in more ways than you might think! From the friendly ushers who greet you at the Charles W. Stockey Centre, to our amazing hospitality committee hard at work baking treats for our receptions—our volunteers do it all. Come and share your talent with us. If you would like to help out with any of our events, please look over our volunteer positions below and email info@festivalofthesound.ca if you are interested. Greeter: First impressions are important, and greeters provide that welcoming first impression for guests. Prospective candidates should be a current or past board member with excellent people skills. Sound Selections Gift Shop: A volunteer with duties in the gift shop including: handling cash, using debit/credit machine, customer assistance, tidying and restocking and CD sales. There will be a training session prior to the season’s opening. nations, and interacting with patrons to solicit donations. This is usually located at a table in front of the Charles W. Stockey Centre performance hall. Will-Call: This volunteer will hand out pre-purchased tickets at the Festival of the Sound box office. Set-up, Clean-up, Server: A volunteer to assist with any special events, fundraising dinners, donor appreciation events, etc. at the Charles W. Stockey Centre or off-site. Usher/Basket-Passer: This volunteer will attend pay-what-you-wish concerts, church concerts, and other off-site events. They will greet patrons, collect tickets, and offer a donation basket. 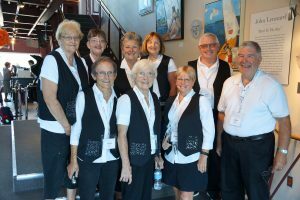 Ushering: Volunteer ushers are needed at all regular concerts at the Charles W. Stockey Centre. Please contact Nicole Mullen through the Stockey Centre to sign up and be trained (705-746-4466 ext. 208). Transport: Volunteer drivers are needed for musician transportation. Routes may include from the Festival Station Office to the Charles W. Stockey Centre, airport pick-up, Music Scores trips to local schools, etc. Page Turner: This volunteer will assist the artist on-stage during rehearsals and concerts. Must have music education and training. Audition required. Brochure & Poster Distribution: This volunteer will visit local businesses, churches, attractions, and information centres to restock their supplies of our brochures and posters for upcoming events. Visits to possible new locations are encouraged.